Get ready to easily create multiple designs from a particular image using the patented process of monUnique. monUnique is an amazing cross-platform app to design beautiful creation by only using the convenience of your own smartphone or tablet. We loved this design app so much that we decided to pronounce it a Design App of the Week. See why below! Developed for Android and IOS users as an incredible photo design tool this app allows its users to easily and without much effort create various designs from a specific photograph using the amazing patented process available. 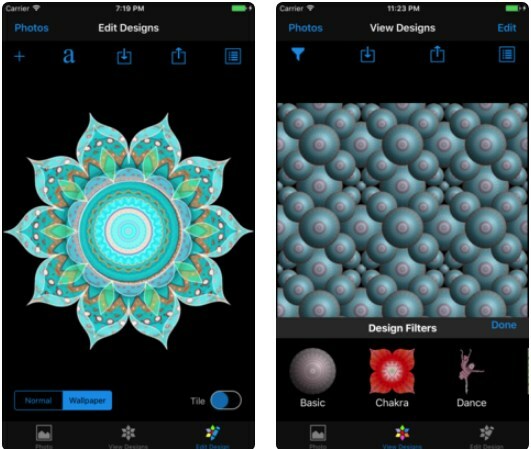 With this design app, users are offered to just click a photo and apply design filters, creating multiple Scalable Vector Graphics (SVG) that are based designs consisting of multiple design objects of varied shapes and textures available on this app. Simple, just by using their phones, users can create unique and interestingly designed photographs. This design tool for photos allows users by using different design features to create amazing photos. Just by clicking or selecting a photo user can use the Edit Design module to select design filters and view all the designs in that filter that are offered. Also on this module users are able to edit the existing filter or to create a new on from scratch simply with adding design objects available from that filter. On the app, users are offered to select the design filter and add to it transformations such as rotation, scaling, translation or flipping and also they change the design properties of the design object such as texture, color, stroke, fill, overlay, opacity or more, the app also allows users to choose text objects from various fonts available. When the user chooses a photo from the gallery, just by touching the texture of the shape will be able to change the photo design. The app offers 3 modes and users are able to use the gestures for zooming and panning their design, toggling the tile switch and touching the filter icon for displaying lists of fonts and filters. The photo edited can be saved in a gallery or shared on social media by preference. The Edit Design Tool is supporting 3 modes, the wallpaper and normal mode and users are able to choose among lots of fonts and filters, saving the photo or they can change the properties of the design of the photo they are designing and editing. Download the app for free on Google Play and App Store to apply different filters and objects to photographs!